I know that a dog toilet in your garden is not a great subject to talk about today, but I know it will be VERY useful for lots of people! 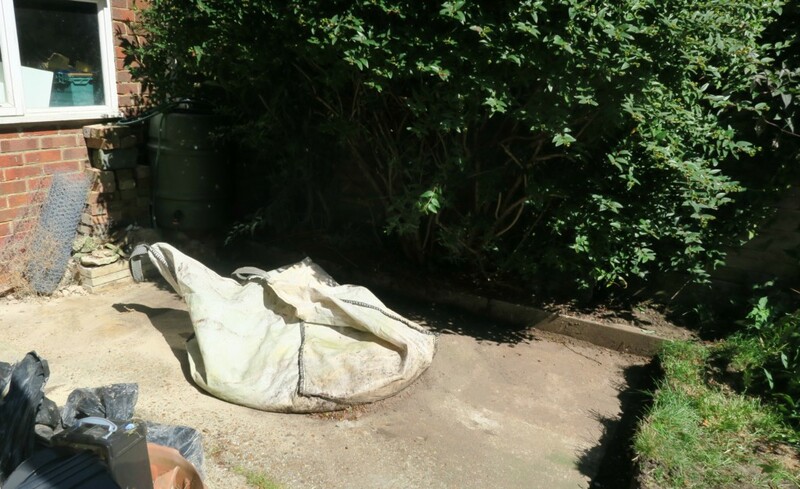 We have been making a start on our garden redesign and gathering lots of ideas and clearing old plants and starting to get an idea on what we need to do. However, my first step was to stop the dogs toileting on the lawn, I don’t like them doing it where the children want to play and also it kills the grass. So as we were getting a new puppy Gus (which I am sure you’ve seen on Instagram!) I thought it would be best to get him into good habits from the very start, that way he knows nothing else. 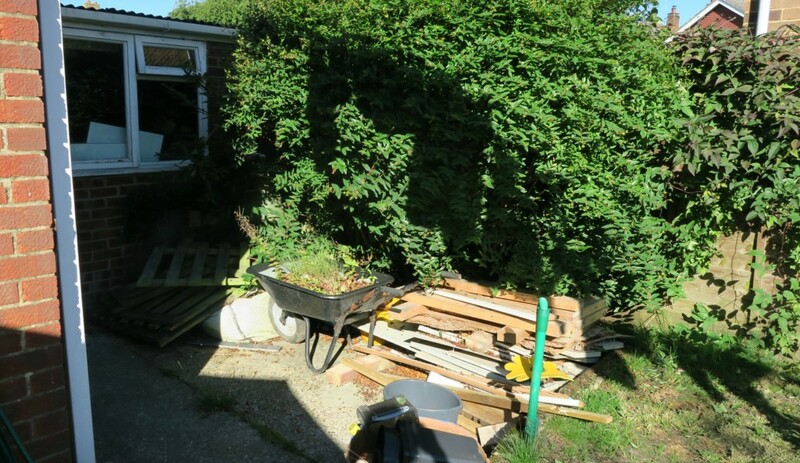 We have a side area in front of our garage, that was only covered in rubbish and overgrown plants. 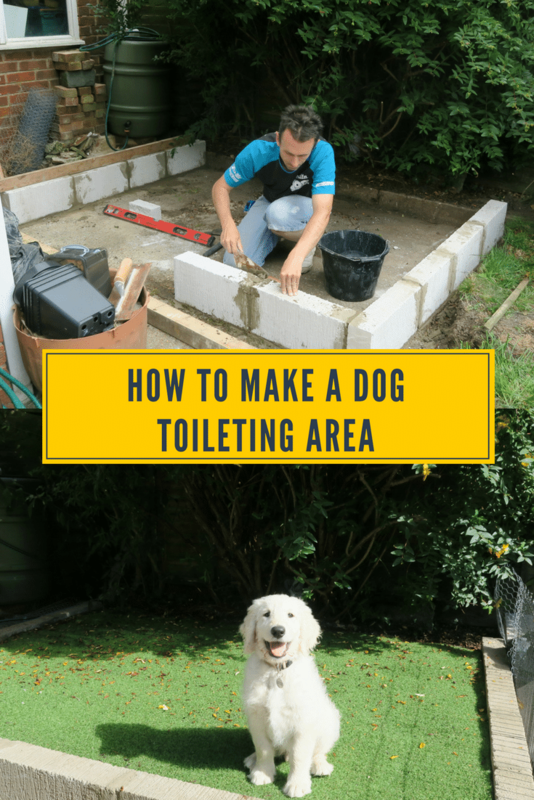 So this would be a perfect place to have an outdoor dog toilet area, easy to get to from the back door but tucked around the corner and out of sight. So, the task was set and Hubby cleared it out, to reveal what space was there. This was large enough for the dog to toilet, and pace around to find the perfect spot…like they do! It was laid on concrete and there was no chance we were going to be able to get the concrete up, it was solid and went down very deep. However this gave hubby a good flat surface to lay the blocks on. 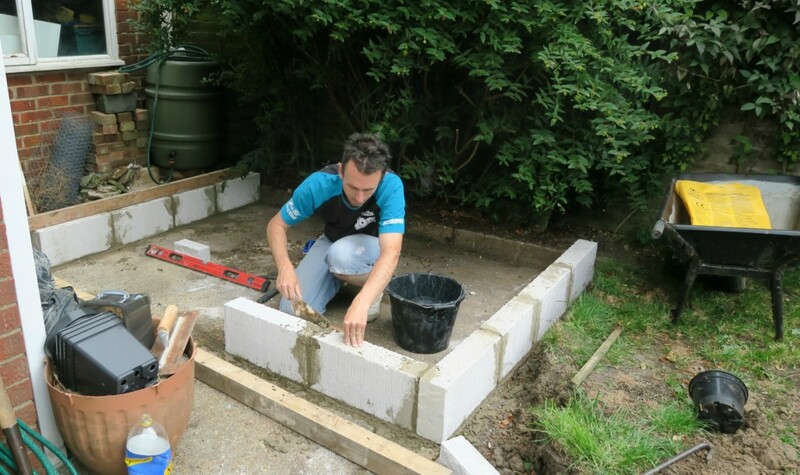 You will need some footings on yours if you are laying your blocks onto soil. I only wanted it one layer high, so pretty easy to build. Hubby has never built a wall before, so he went with the easy option of buying ready-made mortar, so he only had to add water. Place some mortar on the floor to sit the blocks on, some on the edges to join them up, and check each one is level with a spirit level. Build your wall to as large as you want it, a smaller dog wouldn’t need as much space. Hubby also popped some copper piping in between a couple of the blocks for some drainage. Also added some large rocks to help with drainage too. Once you have the wall built, you need to fill it with soil. We just used soil from another part of the garden that wasn’t being used anymore. Or purchase some top soil. 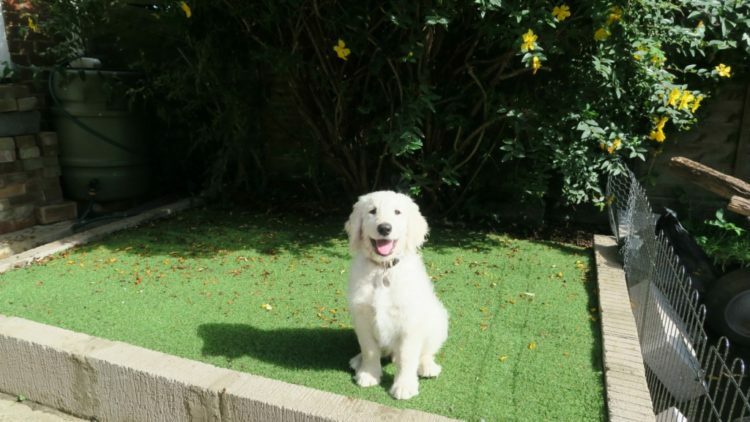 We decided that the best surface for our dog toilet area was artificial grass, the reason why is so that the wee doesn’t kill off the grass and become a mud patch, however if you would prefer real grass then just add some turf on top of the soil. So we added some weed membrane over the soil to help stop the weeds coming through, and then laid our artificial grass on top, pinned down with some outdoor stakes. It doesn’t look very pretty at the moment, and I am sure it won’t ever look pretty but in time we will render the blocks, then try to disguise it a little. It has worked great, the new puppy runs outside and wees on his dog toileting area, then comes running to me for a treat. He knows when I send him onto the patch and say ‘hurry up’ he knows just what I want him to do! To keep the patch clean and to stop the smell building up we have purchased some Odourfresh Pet Disinfectant in bubblegum fragrance. This is working brilliant, and I really recommend it. Without it the patch can get smelly, but this keeps on top of it and also smells just like bubblegum! There are lots of scents, but everyone was recommending the bubblegum in the reviews, so that’s what we went for. *Post contains affiliate links, you don’t pay anymore for the item, however I get a small commission for referring you. So, after training to go in that spot is he reluctant to go in grass say at the park or on a walk? Brilliant! We have something similar and it works a treat! We are British but live in Texas – when I read you tell your dog to “Hurry up” I knew you were British too! Barbara Woodhouse books?? We have been living here for nearly 20 years and have had 5 dogs in this time, and all of them would go and “hurry up” in their reserved spot. We have an area to the side of our house which is totally hidden from view. 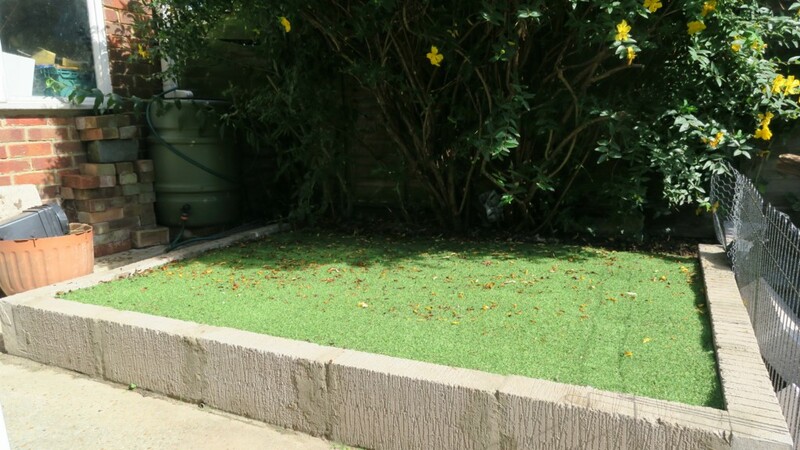 We had grass for some years but it was not good – muddy, unpleasant and the dogs would refuse to go there after it had rained , until a landscaper suggested to lay about 3 inches of mulch and it is working wonders. We buy red mulch so it gives a bit of color and it has a nice scent of fresh wood chips and just renew it every year. No maintenance! Happy doggies, happy owners! Thanks for sharing! What a great idea! Did this work out during the winter, is Gus still using it? We have a little toileting area out our back garden too for our big pal too. Wow you did some proper buying for this little guy. Fair play to you. Looks lovely. I don;t have a dog, but I imagine that this is a hard thing to teach them. What a great idea glad to hear its working well, your dog is gorgeous. aw good idea to have this – keeps everything in one place! Amazing idea! A one happy dog!